These will be avail to ship in Fall 2013. Mixed Rock Garden Allium are wonderful additions to tuck in rocky and in hard-to-grow places. 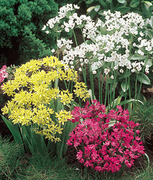 Bright and perky blooms of yellow, pink and white in late spring and early summer. Grows 4"-20" tall.